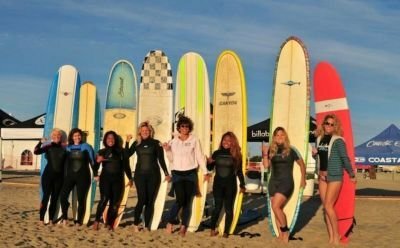 In 2012, The Wahine Surf Club originated in Virginia Beach, Va., but the world of waterman sports is truly one without borders. We started by sharing photos, videos, meet-ups, events and news to create a cohesive community in our hometown, but realize this group — and more importantly its message — has the potential to grow into something much larger. The sports we are passionate about are enjoyed throughout the world, and the community we’ve created can be as well. Regardless of where you call home, feel free to share your perspectives and enjoy the camaraderie of people who are as passionate about the water as you are! Surfing, standup paddleboarding, kayaking, canoeing, windsurfing, kiteboarding, wave skiing, bodyboarding, skimboarding — anything goes! Our vision is that each club member is empowered to plan events, spread the word about upcoming happenings and/or post about brands and businesses offering products and services related to the love of waterman sports. The free-flowing exchange of this information promises to enhance every members’ experiences — both in and out of the water. Though the word “wahine” in Hawaiian roughly translates to “woman,” we welcome and encourage men to join and share their perspectives to enhance our inclusive community. Through this vision, we hope to get more women and girls involved with what we feel is the world’s healthiest and most fulfilling sports and the corresponding lifestyle; which often leads to increased exercise, a strong sense of community and, eventually, the desire to travel the world in search of pure stoke! As the club has grown, our mission has expanded as well. Our mission is to promote a healthy active lifestyle and the importance of water sports to our area, participate and support local community service programs, environmentally conscious minded, and we host our annual event in October called Coastal Edge Surf For The Cure which is to bring awareness to breast cancer and raise funds for our local chapter Susan G Komen of Tidewater.